The only time I had ever tasted Okra was when I had the Campbell's chicken gumbo soup. Until recently, I have discovered that Okra can be very tasty when cooking them fresh. The only problem I am experiencing is that not every supermarket here carries them. Sometimes, I need to drive around several supermarkets in order to find Okra. Today, I wanted to try something new. I remember one day when I walked past a restaurant in Hong Kong during my trip, I saw they had a menu posted by the entrance. Their menu really caught my eye as the images of their dishes looked beautiful and delicious. There was one dish I mistakenly thought it was an Okra, Chinese black olives, and ground meat stir-fry from the image. In fact, those were some kind of green beans, not Okra in that dish. Because of the mix-up, it gave me an idea of pairing Okra with black olives. I didn't use Chinese black olives today, but only used the ones I have at home. Adding shrimp into this dish, I knew I would enjoy the dish as I am a big fan of shrimp. Wash and drain shrimp. Dry shrimp with paper towels. Mix shrimp with corn starch. Put one tablespoon of oil into a frying pan over medium heat. Place shrimp in the pan, and saute until cooked. Remove shrimp from the pan. Put one remaining tablespoon of oil into the pan. Saute garlic and ginger. Add in okra and stir fry them until tender. 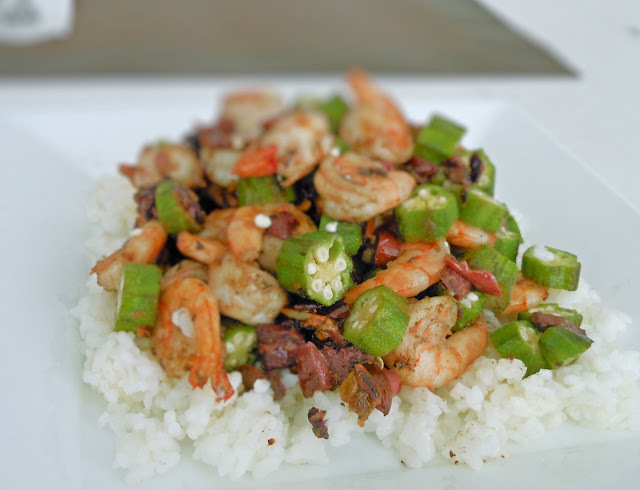 Finally, add black olives and cooked shrimp into the okra and toss together. Serve with risotto or any kind of your favorite rice.